Do you hear faint scratching or pitter-patters above your head? What about an unexplainable stench coming from your walls or ceiling? If so, you might have rats in your attic. As soon as you suspect you have rats in your home, it is imperative to do what it takes to get them out. The longer the stay, the more costly the damages and potential health threats. It is advised to avoid contact with wild rats in your home. Avoiding contact can keep you and your family safe from the diseases they spread through feces and urine, as well as in their fur. 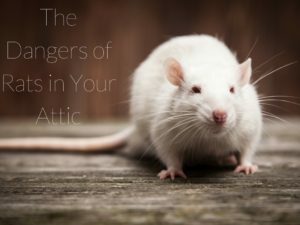 Because rats typically scurry about your home, not remaining in one location, the threat of contracting diseases from rodents grows the longer they remain, which is why we recommend you call experts as soon as you hear noises in your attic. Recently, a breakout of a rat-borne illness occurred in a New York neighborhood resulting in three individuals contracting leptospirosis. Health officials recommend anyone working in an area potentially harboring rats should always wear shoes and wash their hands frequently. If your home is inhabited with these unwanted critters, it’s important you and your family take similar precautions to prevent illness. To learn more about the recent outbreak, check out this New York Times article. At Critter Control® Miami, our technicians are trained to handle rats properly, both living and dead. We’ll inspect your home and work with you to come up with a plan on how to best eradicate the infestation. We also clean and repair any damages the houseguests may have left, and seal entry points to ensure they can’t come back. Keep your family safe and schedule your free consultation by calling 305-258-3587.